Crossword Promotion Success PowerPoint Templates And PowerPoint Themes 1012-This PowerPoint template contains an image of crosswords related to website promotion. This image represents the concept of internet and innovation. 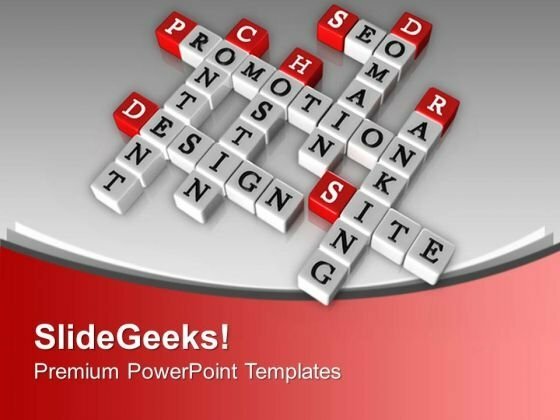 Adjust the above image in your PPT presentations to visually support your content in your Marketing PPT slideshows. Our PPT images are so ideally designed that it reveals the very basis of our PPT template are an effective tool to make your clients understand.-Crossword Promotion Success PowerPoint Templates And PowerPoint Themes 1012-This PowerPoint template can be used for presentations relating to-"Crossword promotion, Advertising, Technology, Business, Boxes, Cubes" Hand your team the perfect strategy with our Crossword Promotion Success PowerPoint Templates And PowerPoint Themes 1012. Try us out and see what a difference our templates make. Facing upto difficulties is an essential element. Bolster everyone's courage with our Crossword Promotion Success PowerPoint Templates And PowerPoint Themes 1012.